Get a grip on those accidental spills with this fast food tray. The classic scratch-resistant basket weave design reduces slipping on this 16" x 12" standard size fast food tray. 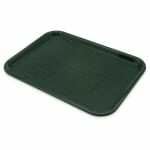 This fast food tray comes in a mystifying forest green color and is sold in a set of 12. This tray is great for buffets as well.